It was an uneventful food weekend for me, with the exception of my attempt at the Vegan Magic Cookie Bars, which I drooled over when they were posted at FatFree Vegan Kitchen last week. 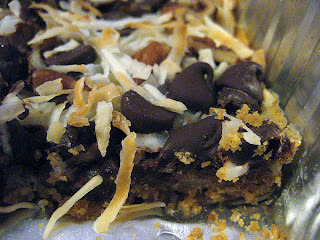 I managed to screw up the recipe, but luckily, these bars are forgiving and they still tasted yummy! Hi! What a great story! I'm so glad they turned out to be edible and at least you got a second batch out of them. Hi Jenny, thought I would let you know that I have added you to my list of favourite sites on my blog.